To find an available propane autogas conversion system certified by the strict emissions standards set by the California Air Resources Board (CARB). 102,000 fewer gallons of gasoline burned by switching to propane autogas. 70 percent cost savings per gallon. $135,000 in fuel savings per year, not including $.50-per-gallon tax credit. 5 million pounds of carbon dioxide eliminated from Kamps Propane’s total carbon footprint over the vehicle lifetime of the fleet. 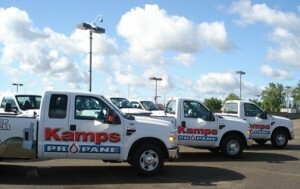 Kamps Propane maintains a long history of running Ford trucks in their company’s fleet. 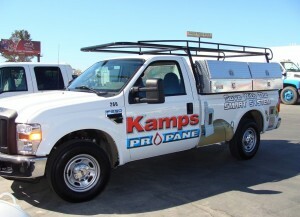 When a propane autogas fuel system for Ford platforms became available, Kamps knew this was the clear choice for their propane distribution company. Based in Manteca, Calif., Kamps Propane services the northern California markets around Fresno, San Francisco, Sacramento and the surrounding communities. In business since 1969, the propane distributor has operated propane autogas vehicles in their fleet as reliable vehicles became available. Once ROUSH CleanTech vehicles gained certification by the Environmental Protection Agency (EPA) and California Air Resources Board (CARB), Kamps Propane knew they had found their alternative-fuel technology solution. In 2010, Kamps purchased 25 ROUSH CleanTech propane autogas Ford F-250 trucks for customer service and repairs at customer sites. They selected the in-bed tank configuration for its large 55-gallon usable fuel capacity. Then, when some older gasoline-fueled service trucks needed replacement in 2013, Kamps chose Ford E-250 propane autogas vans, which they found ideal for appliance repairs. Each of Kamps’ propane autogas vehicles delivers the same horsepower, torque and towing capacity as its gasoline-fueled counterparts. For many fleets, running a propane autogas fleet makes both logistical and economic sense. This is especially true for propane distributors. Kamps pays $1.13 for propane autogas compared to $3.75 for their gasoline. With 12 retail locations throughout California, refueling stations are convenient and readily available for the managers and service technicians who drive the trucks daily. These stations are the same sites that Kamps Propane drivers use to refill propane cylinders. Ten of the stations are staffed with daily operating hours open to the public, and the other two have a key lock system to provide 24-hour access. “In addition to the $135,000 in fuel savings this past year, our drivers save 10 to 15 minutes per transaction by filling at the company dispenser rather than at a gas station,” Ayres said. Along with the cost savings, Kamps recognizes the clean-burning effects of propane autogas. “Of course the obvious benefit to Kamps Propane is the cost of the fuel, but there is also the benefit of the longevity of the clean-running engine,” Ayres said. Although the company does adhere to Ford’s recommended oil change schedule, Ayres has found that the intervals can be extended substantially because of how clean the oil is after it’s changed. Driven an average of 25,000 to 30,000 miles per year, Kamps propane autogas vehicles displace approximately 102,000 gallons of gasoline fuel. The lifetime of each vehicle is estimated to be 150,000 miles. By switching to propane autogas, the company has decreased its total carbon footprint, emitting 1.5 million fewer pounds of carbon dioxide over the fleet’s lifetime. In addition to carbon dioxide emissions reductions, propane autogas offers many other types of environmental advantages for the company. The fuel burns cleaner than gasoline or diesel, with up to 20 percent less nitrogen oxide, up to 60 percent less carbon monoxide, 24 percent fewer greenhouse gas emissions, and fewer particulate emissions when compared to gasoline. It is the third most widely used fuel worldwide, following gasoline and diesel. More than 90 percent of the propane used today comes from domestic production sources. By committing to a fleet of propane autogas trucks, Kamps Propane has the opportunity to show their customers that they trust and support their product. “We have to stand behind the product we sell. All of our sales people work with local associations and customers to introduce autogas,” said Ayres. “One of our propane autogas vans serves as a marketing tool at frequent weekend events.” Kamps Propane continues to explore new and innovative ways to promote propane autogas in their service area.